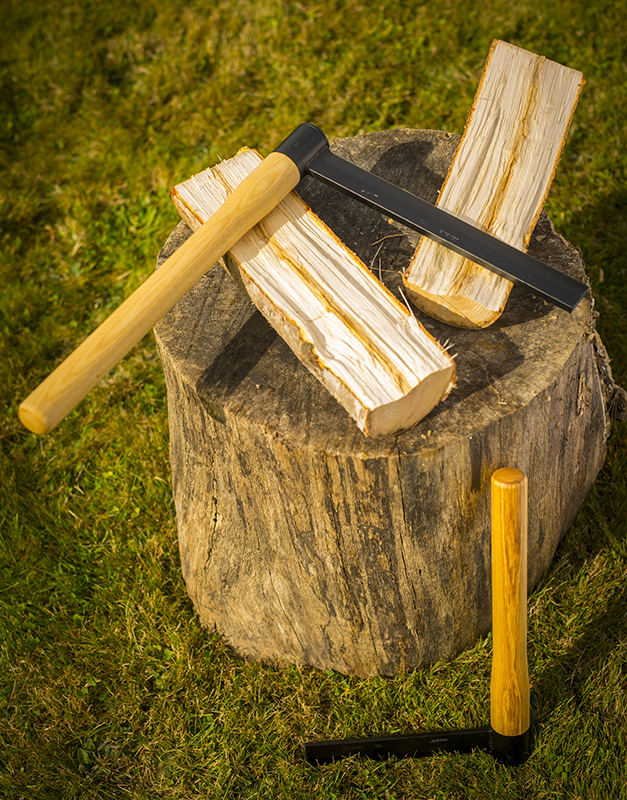 Froes are L-shaped tools used in combination with mallets and wedges to rive green wood along the grain with more precision and finesse than an axe or maul. They are used to make planks, chair parts, tool handles, shingles, basket splints, blanks for spoon carving, and more. Lie-Nielsen Froes are designed by green wood riving expert, Drew Langsner. Having split and rived stock for decades, Drew redesigned this traditional tool with several key improvements. The blade width is less that on most antique examples. This is for improved leverage - handle length relative to blade width. The blade thickness is 3/8" for adequate strength. The bevel angle of 30° is ideal for both soft and hard woods. Common froes were typically made from one piece of steel, bent into a loop at one end to form a ferule to receive the handle. However, the uneven shape of the ferule made it difficult to secure a hand-carved handle that wouldn’t work loose over time. Our froe blades are welded to a cylindrical ferule and have a tight-fitting, turned handle secured with a stepped washer and large lag screw. They are built for longevity and durability. Lie-Nielsen Froes are finished in a tough, baked powder black enamel. Handles are kiln-dried hard maple.